“In the northern part of the City of David (Kenyon’s S II), crude ashlar masonry has come to light, described by the excavator as in secondary use in the 8th century BCE. Two fragments of a Proto-Aeolic capital (J 1; PL. 15:1) were found amongst the ashlar debris at the top of the eastern slope above the Gihon Spring. Elsewhere we have suggested that several of the Quarry sites found by Kenyon in the Armenian quarter of the Old City of Jerusalem are of the Iron Age, prior to settlement of that part of the city in the 8th century BCE. In recent excavations there, this has been confirmed stratigraphically. In Jerusalem, however, the limestone quarried in the Iron Age was of the meleke variety, harder and finer than the nari” (Yigal Shiloh, The Proto-Aeolic Capital and Israelite Ashlar Masonry (Qedem 11; Jerusalem: Institute of Archaeology, Hebrew University of Jerusalem, 1979, p.58). “The southern face of the Byzantine city wall left standing by Kenyon would now be dismantled, allowing us to reveal more of the impressive northeastern wall of the Extra Tower. And, indeed, we were able to double the length of the exposed segment, which now measured 8 m long and reached 5.5 m in height. The newly uncovered stones also displayed the same drafted margins and protruding bosses, laid in alternating long horizontal and narrow vertical stones. …As it turned out, the Byzantine wall was found to be built directly on top of Second Temple period walls, which in turn were built on top of undisturbed First Temple period earth fills that descended to a depth of 2 m above bedrock. These fills abutted the outer face of the northeastern wall of the Extra Tower, thus providing the terminus ante quem, or latest possible date, for its construction. This was a wonderful surprise because we did not expect to come across any undisturbed layers following Kenyon’s excavations in the area. Due to the importance of these fills, Hagai took special care to pay close attention to the differences between the various layers, and was able to isolate about ten sub-phases that lay one on top of the other in a slanted direction, from the Royal Structure southward to the northeastern side of the Extra Tower. It became quite clear that we were dealing with massive accumulations of refuse that had been thrown out from the Royal Structure onto the steep slope below. …We now needed to take into account that the Extra Tower was added to the fortified complex, which included the Royal Structure and gatehouse complex, as a reinforcement of what was a highly strategic area and could have been built any time between the late 10th and late 8th century. In hindsight, a more precise dating could have been supplied had Kenyon herself subdivided the fills adjacent to the Extra Tower, especially since, as we know today, these 8th-century refuse layers covered and extended over the wall uncovered in 1986. However, even though these reached the steep bedrock in the slope beyond the wall, the finds that could have been isolated in the area between the wall, the Royal Structure, and the Extra Tower – but which were concealed by the 8th-century layers – would have given a more secure terminus ante quem for the construction of the tower” (Eilat Mazar, Discovering the Solomonic Wall in Jerusalem, 2011, pp. 115-119). “In my grandfather’s Temple Mount excavations, a large wall was uncovered adjacent to the outer eastern corner of what we know today to be the Royal Structure, preserved to a height of 4 m and a width of 2.4 m and displaying a similar construction style. When viewing it from the north, it was possible to see that it was built directly upon bedrock. We were able to follow it along a straight line for 37 meters toward the northeast, and its straight route makes sense when taking into account the topography of the Ophel: the wall lies on the straightest part of the otherwise curving hilltop, and so we dubbed it the Straight wall. We were eager to learn more about the wall that seemed to conform so well to the fortification line that emerged from the Gatehouse complex and the Royal Structure. This fortification line gradually ascended the slope of the hill until reaching a straighter topographical line along which this wall was built. …We cleaned a small area of about 1x1 m at the foot of the juncture of the southeastern wall of the Royal Structure with the Straight Wall, where we assumed that any earlier remains would have been disturbed by the later cistern, and were thus surprised to uncover a number of undisturbed stratified layers from the First Temple period lying adjacent to the southeastern face of both walls down to bedrock. We thus had the unexpected fortune to collect more finds that would add even more data to our understanding of the Royal Structure and dating of the Straight Wall. Although the excavation area was very small, it was obvious that we could get answers to some crucial questions. …We were sure that excavating such a small area with a depth of 2.25 m would not take long, two or three days at most. No one could have imagined that it would last a month and a half! Brent essentially scratched off layer by thin layer in order to make sure that he would not miss any valuable data, revealing a picture of refuse thrown out from the Royal Structure which piled up at the foot of its outer wall. Needless to say, all the earth fills from his excavation were sent for wet sifting, with the lowest 20 cm found to contain mainly bowl and jar sherds, similar to those found in the lower gatehouse fill, and dated to the second half of the 10th century. The continuation of this lowest layer in the direction of the Extra Tower in the west may very well have been the lowest layer missed by Kenyon during her excavation in this square, which could have supplied a much earlier terminus ante quem for the construction of the tower. However, it seemed that Kenyon was right in dating at least some of the stratified layers, probably those above the lower 20 cm, primarily to the 8th century. 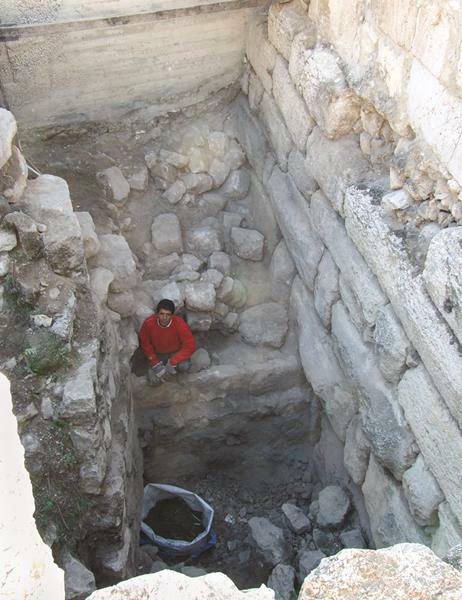 The refuse layers that abutted the Royal Structure and the Straight Wall were similar to those that abutted the Extra Tower and should thus be considered part of the same accumulation” (Eilat Mazar, Discovering the Solomonic Wall in Jerusalem, 2011, pp. 120-123). With these three accounts taken together, it is reasonable to assign the construction of the Extra Tower to Phoenician masons from the time of King Solomon.